Enjoy the more relaxed dress code! Ever since I quit my job I have been living in denim. That top is perfect on you! Super cute top and shoes! I love getting to wear dressy jeans to work! I'm loving, loving those shoes - they are so great! those shoes make your top pop! I love your outfit all the pretty colors are gorgeous. I love it!!!!! your adorable pixie makes me want to cut my locks! Oh, how I heart your top and shoes.. So adorable! Actually, it's really nice to see fashion bloggers that wear denim regularly - sometimes jeans is just exactly what you want to wear, and it's good to be reminded that they can be an important part of your wardrobe! 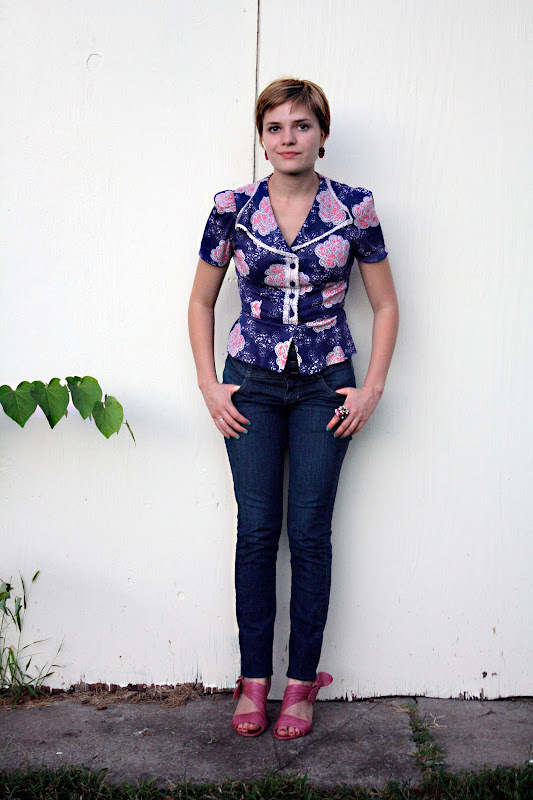 I love this look, and how you styled the jeans with that lovely blouse! I'm so excited for the weather to cool a bit so I can wear denim again! My nails are painted the same colour as yours haha can't stop wearing this colour! I just found your blog and I love it. Your style is wonderful! those shoes again, now you're just teasing!!!! i love them so much, and especially with those tops! gorgeous. love your post (as always).